Do Pets Help Prison Inmates? 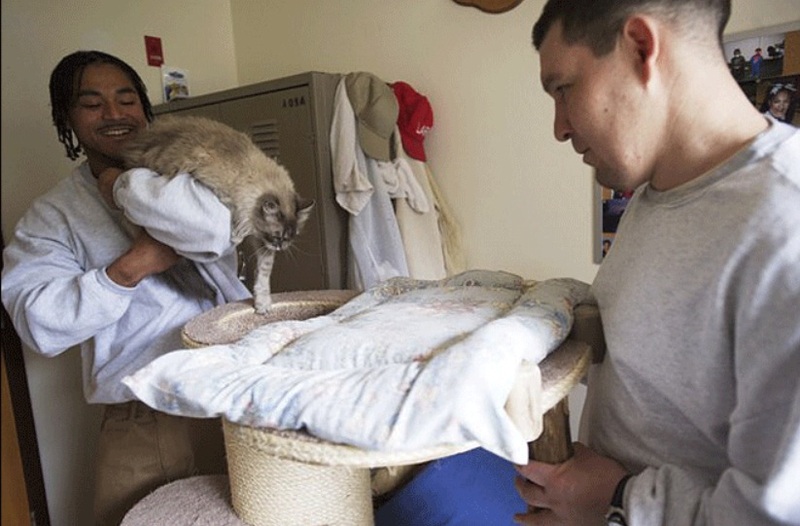 Larch Corrections Center inmates William Lozano, left, and Richard Amaro and their foster cat Clementine. Photo courtesy of Steven Lane, The Columbian. The behavior of inmates at Larch Corrections Center in Washington State who took part in a cat fostering program seemed to improve, according to this article on Katu.com. “When you’re doing prison time, you get set in certain ways and forget what it’s like to have everyday interactions and be compassionate,” said Joey Contreras, an inmate who looks after a cat named Princess Natalie in his cell. “It’s a little different when you have an animal depending on you to survive. Animals bring out the best in people,” Contreras said. However, a 2006 study from the Kansas State University’s Department of Sociology, Anthropology and Social Work said the beneficial effect of pets on prison inmates is largely anecdotal.Prison pet programs existed in at least 20 states as of 2006 but no one has done a comprehensive count of how prevalent such programs are, the study said.